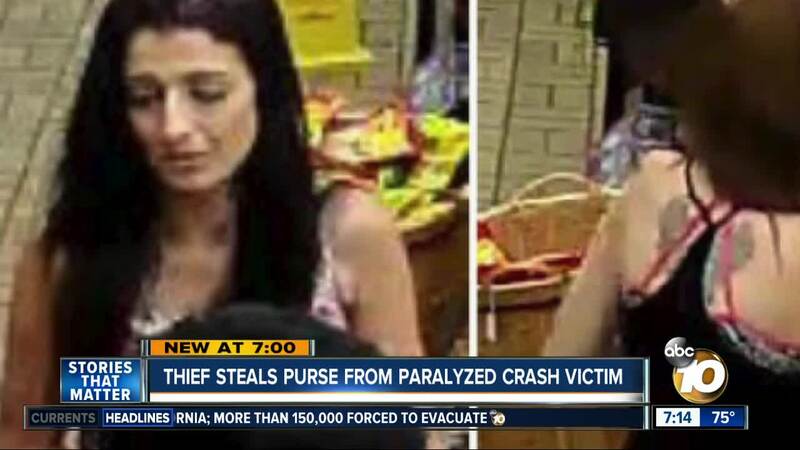 SAN DIEGO (KGTV) — As a woman lay paralyzed from a horrific accident, police say someone was inside her car, stealing from her. The search for that thief is now turning to San Diego County. "She was the nicest, most wonderful person I've ever known," said Don Nelson. Nelson says his wife of 27 years, Terri, was on her way to pick up her father for a hospital trip in August when a truck rear-ended her car at a stoplight in Riverside. As she lay with her neck broken, amid the commotion of bystanders and first responders coming to her aid, police say someone got into her car and stole her purse. Detectives say within days of the accident, surveillance images show her using Terri's credit cards and writing checks in her name. Nelson says as some $5,000 worth of purchases were made at various businesses, from fast food restaurants and Albertsons to Costco. "I think that's the lowest form of life that could possibly be. You have to be a sorry person to do something like that," said Nelson. For three months, Terri was paralyzed and on a ventilator, until she passed last week from complications from the accident. Her husband's grief is not the only emotion that consumes him. There is also anger. He's still dealing with collection agencies seeking money from the thief's shopping spree. During that crime spree, police believe the woman rented a Nissan Rogue in Terri's name, before the CHP pulled that car over on a highway in San Diego County. The two men inside the car have yet to lead detectives to the woman, but police hope tips from the public will. "I just can't believe a lightning bolt didn't strike the person. I hope they never run into me, and I know who they are," said Nelson. Nelson believes the rented car was pulled over near downtown San Diego, but the CHP has not confirmed that. If you have any information on the case, call the Riverside Police Department at 951-353-7115.